It is noteworthy that the International Convention for the Safety of Life at Sea (SOLAS), 1974 Chapter II-1 (Construction - Structure, subdivision and stability, machinery and electrical installations) prohibits the new installation of materials which contain asbestos on all ships. International Maritime Organisation (IMO), a UN agency found that asbestos-free ships are getting re-contaminated when they dock at ship yards for repair or when new spare parts are installed. 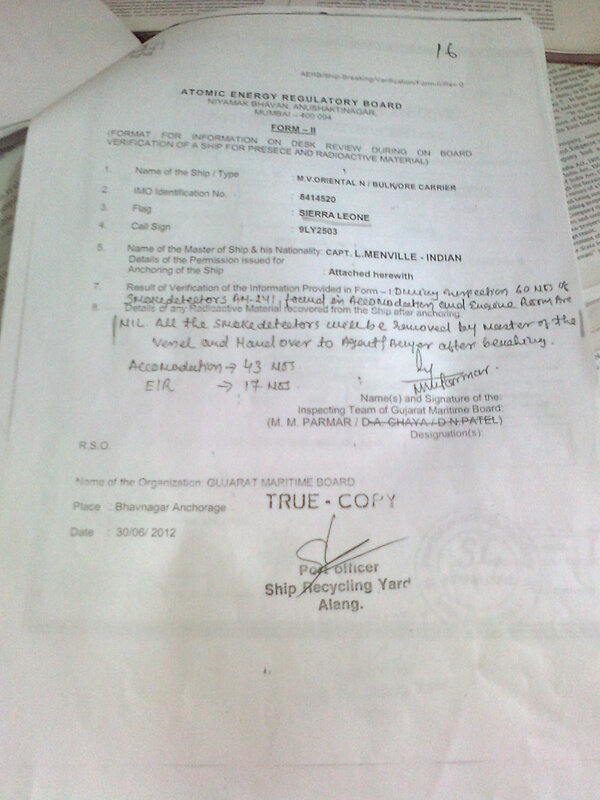 In 2011 the IMO banned installations on ships of all materials that contain asbestos. • Asbestos is used for its specific characteristics such as fire resistance, thermal insulation, electrical insulation, strength, flexibility, etc. Therefore, asbestos is used in various locations throughout a ship. Inspectors should be aware of the large number of probable asbestos applications on board. • Asbestos is a fibrous material and can often be identified visually on that basis. However, most asbestos is used on board in materials where it cannot easily be identified visually. • It is recommended that, whenever an item or material is to be installed, it is ensured that the item or material has a statement of compliance, or similar, with the relevant SOLAS regulation. This may take the form of an "asbestos free declaration". Due diligence should be paid to such statements or declarations and it is recommended that random confirmations are carried out. • Although asbestos in most ACMs can only be ascertained by experts in specialized laboratories, it is possible to provide training to crew members, surveyors and inspectors in identifying materials that might be ACMs. As a result of such training, the crew and ship surveyors and inspectors can avoid health risks by having the suspected material sampled and analysed first. In case sampling and analysing by experts is not possible, the crew and ship surveyors and inspectors should treat the material as if it contains asbestos in order to avoid possible health risks. • Surveyors and inspectors that are charged with asbestos investigations on board ships should be trained in recognizing asbestos and Asbestos Containing Materials (ACMs). They should also be trained in taking samples and should be instructed when to call in experts to conduct the investigation. • When asbestos is detected on board, in contravention of SOLAS regulation II-1/3-5, action should be taken to have it removed. The removal – assigned to professional asbestos removal companies – should take place within a time frame of 3 years from the date when the contravention is found and should be conducted in close consultation with and, where applicable, under the supervision of the flag State concerned. It may be noted that professional asbestos removal companies are not known to exist in India. GPCB and GMB do not have the skills to undertake survey and inspection because they are not trained in recognizing asbestos and ACMs. Agencies like GPCB, GMB and Union Ministry of Environment & Forests have ignored that export and import of Asbestos waste (dust and fibers) is banned in India. Waste is a waste irrespective of where it is found. The Hazardous Wastes Management Rules, with regard to Waste Asbestos is mandatory and whenever it will apply, it will apply only when asbestos waste is embedded in something like the structure of the ship. There is nothing like 'pure' asbestos waste or ‘virgin’ asbestos waste. Hazardous Wastes Management Rules, refer to List of Hazardous Wastes-Production of asbestos or asbestos-containing materials - Asbestos-containing residues & Discarded asbestos and Dust/particulates from exhaust gas treatment and as Hazardous Wastes Prohibited for Import and Export. It finds mentioned even in the Basel Convention as Basel* No. A 2050 RB 010 - Waste Asbestos (Dust and Fibres). In a manifest case of collusion these agencies did not even identify its presence in their inspection report saying there is nothing in the ‘loose form’ contrary to their earlier affidavits. The earlier stand taken by GMB reads as follows: “Now as far as hazardous/toxic wastes contained in the structure of empty ships are concerned, the same should be removed by the exporting countries as such wastes are banned under Basel Convention...Here, India is a non-member of OECD therefore it must be clarified here that it is the duty of OECD countries that they should allow to sail only those ships to the non-OECD countries for recycling, which are made completely hazardous/toxic contained, free from every corner/structure of the ship before being auctioned.” How can they change their position to favor ex Exxon Valdez? Even the collusion Union Ministry of Environment & Forests (MoEF) appears quite evident in the light of the Supreme Court’s order of 20th April 2000. 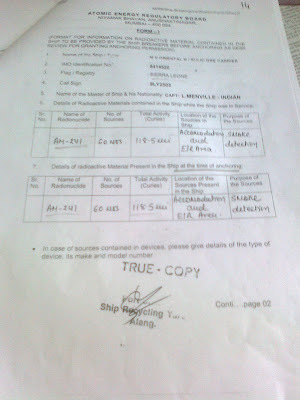 The order reads:”With regard to ship-breaking at Alang, affidavit of Shri Lalit Kapur on behalf of the CPCB has been filed. 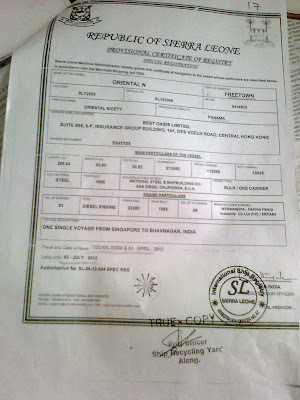 In response to that, the petitioner has filed an affidavit on 15th April, 2000 supporting the stand taken by CPCB. 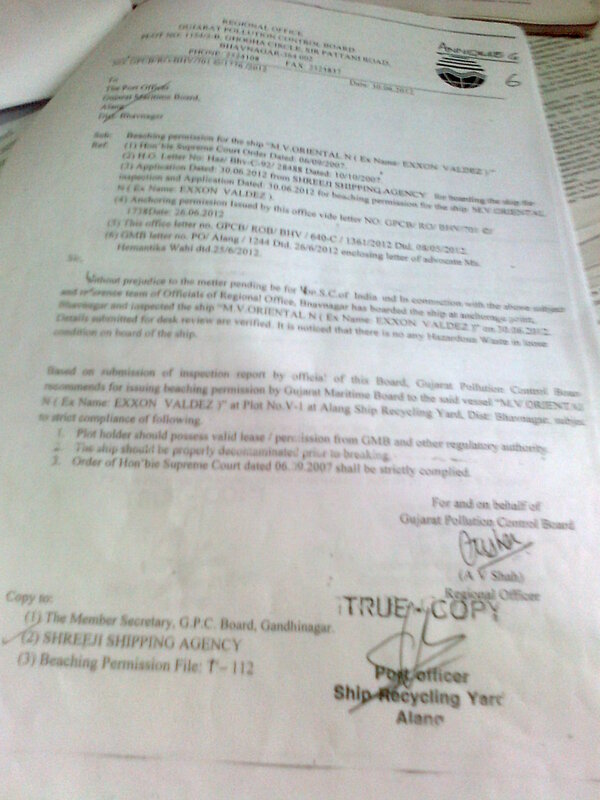 The contention is that steps should be taken to ensure that ships which came to India for ship-breaking should be properly decontaminated before they are exported to India.” Given the fact that Central Pollution Control Board (CPCB) is an agency under MoEF and its Additional Secretary is the Chairman of CPCB, how can MoEF feign ignorance about CPCB’s affidavit in the Court in order to favour ex Exxon Valdez? 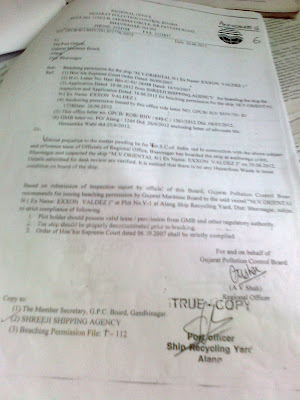 CPCB and Customs deserve appreciation for inform the Court on July 23, 2012 that the ship in question has violated the Court’s order. It is noteworthy that National Human Rights Commission (NHRC) sent a notice to Chief Secretary, Gujarat Government seeking report on victims of asbestos related diseases and has asked why it should not be banned. 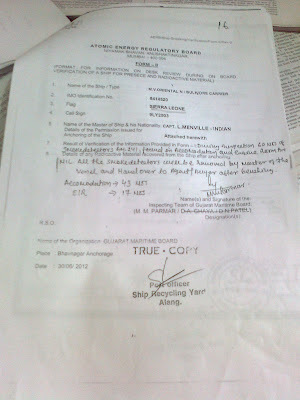 NHRC observed on June 5, 2012 that the Chief Secretary has not filed the report as yet. In ship breaking activity, the migrant and casual workers of UP, Bihar, Odisha and Jharkhand are routinely exposed to asbestos fibers without any legal or medical remedy. Most ports around the developed world turn away ships that don’t carry the correct survey certificate. In a study, published by Mt. Sinai School of medicine, 86% of people who worked in the ship building industry for over 20 years died of asbestos-related illness. In an Indian study on ship breaking workers, which was filed in the court, it was found that 16 % of the workers were exposed to asbestos fibers. Since 1982 till date no worker involved in the ship breaking activity has been compensated for asbestos related diseases. In 1998, the European Council recommended banning the use of asbestos and by 2005, the use of asbestos was totally banned. So far 55 countries have banned asbestos. WHO and ILO have passed resolutions seeking elimination of future use of asbestos. Union Ministry of Labour has disclosed that Government of India is also planning to ban it. All ships are required to carry an “asbestos free” certificate. The Sierra Leon flagged vessel, now named MV Oriental N (IMO No. 8414520) in question is laden with asbestos, persistent organic pollutants, heavy metals, radioactive materials and ballast water. It was previously under USA and Panama flag. 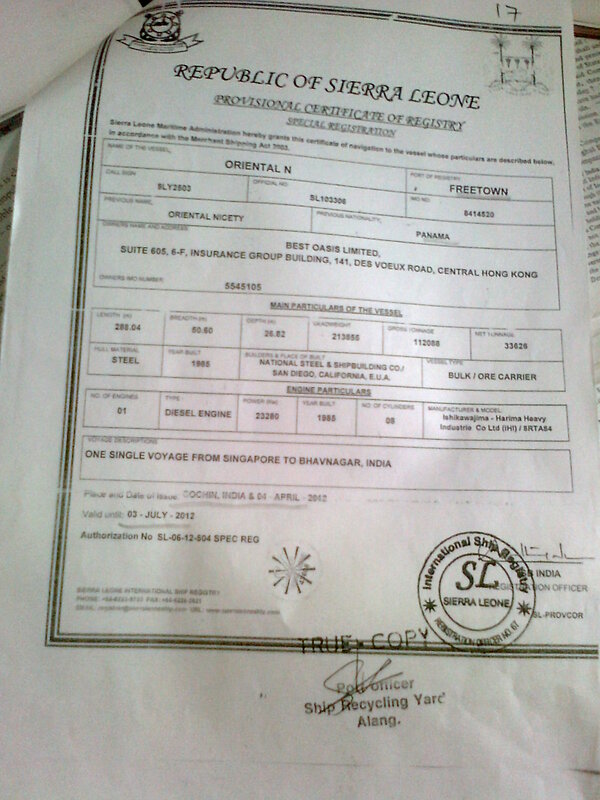 The veracity of the attached Sierra Leon flag certificate has also not been ascertained. It has not disclosed the quantity of these hazardous materials on board. In such a situation, the only option that appears environmentally sound is to send this ship away from the Indian waters. The relevant documents are attached.